The Webley Cub has been appropriately named is created for youth gunners. 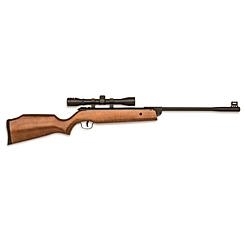 Although the power and design is for a junior shooter, the features of the Cub are no less than a full size air rifle. The Cub features a Monte Carlo wood stock with a rubber buttpad to absorb any recoil. This rifle only weighs 5.5 lbs without the scope and 6.1 lbs with the scope mounted. The lightweight trigger pull and 3-9x40mm scope included, will make each shot crisp and accurate. You'll feel safe turning this air rifle into your youth's hands with the automatic resettable safety catch.